"I have made these ribs for several of my friends and family at gatherings, and they have always gotten me rave reviews from everyone." Preheat an outdoor grill for medium heat, and lightly oil the grates. Tear off two sheets of aluminum foil about 30 inches long, and place onto a work surface. 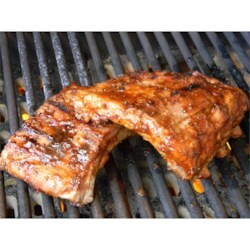 Divide the pork ribs in half, and place half the ribs in a single layer on each sheet of aluminum. Spread the mustard onto both sides of the ribs. Place the brown sugar, paprika, garlic powder, onion powder, black pepper, and cumin in a bowl, and mix until thoroughly combined. Generously rub the spice mixture onto both sides of the ribs. Fold the excess aluminum sheet to make a double-thick top layer; pinch and fold the top and sides together to completely enfold the ribs in foil, leaving room for heat to circulate. Place the two packets of ribs onto the preheated grill, close the lid, and grill until the meat is tender and thoroughly cooked through, about 45 minutes. An instant-read meat thermometer inserted into the thickest part of a rib should read at least 160 degrees F (70 degrees C). Remove ribs from foil, and discard foil. Return the ribs to the grill, brushing each side with the steak marinade. Grill until the ribs show charring and good grill marks and the steak marinade cooks onto the outside of the ribs, about 15 more minutes. Turn and baste occasionally with marinade. Well, all I got to say is THUMBS DOWN for this recipe. you have to have, at least, 3-4 hrs of cooking to get that fall off the bone ribs. I did not care for this method. Do the foil part in the oven at 200F for 3 to 4 hours. Then remove the foil and cook indirectly on the grill. The meat will fall off the bone. Second time making this and it is so easy... And tastes Gerr8! Thank you! Great recipe, i watered down the dijon to get it more evenly on the ribs, Subbed the A1 sauce for some bbq sauce, Had everyone raving! These were very delicious. I had no problem with the times that Kevin set for the ribs. My very picky 4 year old surprisingly asked for seconds! These were an A++ in my book.